The use of a digital camera allows for the digitization of almost any size of translucent photographic original. The most usual sizes, from the half 35mm film (18x24mm) to the 8×10″ (20x25cm) glass plate or film sheet can be easily framed with a lens of suitable both focal length and minimum focusing distance. Digitization with camera avoids any physical contact with the original, preserving its integral properties. As in the case of the scanner, the digitization of translucent photographic originals, needs for a light source. 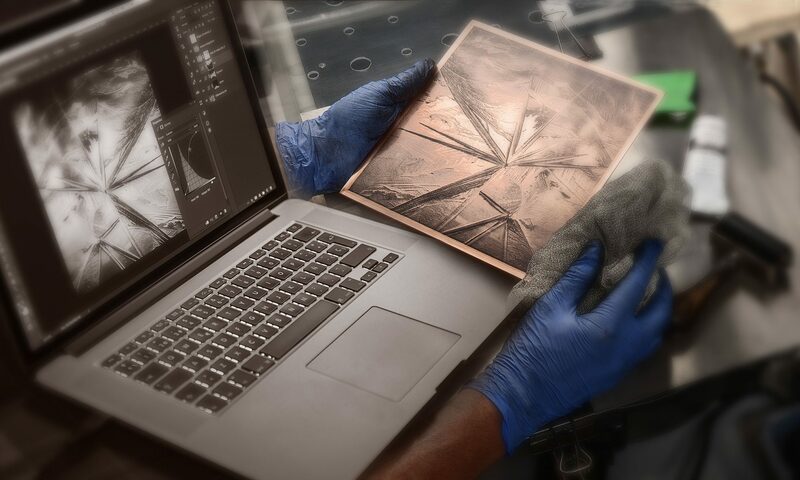 Any light table to classify or observe photographic negatives or slides can be a reliable source to digitize with a camera. Capturing raw files, the dynamic range (DR) of medium and high level digital camera sensors is wider than the vast majority of scanners. This is very useful specially with dense over exposed and/or over developed negatives. Even more, with those originals having a wider DR than the available for a given camera, it is always possible take two or more reproductions changing the exposure time. Alternatively, we can change also the amount of light provided by the light source between captures. A suitable post-processing will allow to merge the complete DR in a single digital file. A SLR or EVIL camera body. Ability to focus on a close object. The camera taking distance depends on the combination of the physical size of the original to be digitized, the physical size of the camera sensor and the lens focal length. Absence of noticeable distortion and/or transverse chromatic aberration (TCA). If one of those aberrations or both are present, they can be corrected in the post-processing stage. Manual tools are provided for most raw files processing software or in Adobe Photoshop. In some cases, there are also automatic correction through lens profiles incorporated to this software. The setting used to fix those lens aberrations can be saved to be later applied to all files taken under the same conditions. A tripod with the capability to place the camera with its lens axis in a vertical way. Even better is a reproduction stand with a column allowing for change quickly and progressively the camera distance to the copy table. A suited light source to illuminate the photographic original by transmission. The translucent white material used as a diffuser between the lamp and the original, can be also be used as a stand for the original. The distance between the diffuser and the lamp can help in controlling the illumination evenness. Tungsten or other incandescent lamps are relatively small in size and this do not help to evenly illuminate the necessary area, specially with large negatives or slides. Additionally, this kind of lamps are high emitters of infra-red (IR) radiation and this can damage both film and glass originals. Fluorescent tubes can be a better option to achieve a smooth and evenly distributed illumination, but they carry two problems, flicker and colour temperature. Electronic flash is probably a very interesting option. It provides high power in a short lapse of time, allowing for also short exposure time completely independent of the ambiance lighting. Flash is also a short IR emitter and has a well balanced colour temperature. The counterpart is its price for evenly distributed sources. An alternative is the transformation of a professional enlarger head. Details of this option can be seen on Digitization System for Film Negatives and Slides (I). Finally, the recent LED light sources can be also an option to consider. Flat LED ceiling luminaries provide a cheap, even and powerful copy stand. LED can be acquired in a variety of colour temperature and all are low or no IR emitters. As in the case of the scanners, probably the most important data to pay attention is the camera sensor DR for a given reproduction conditions. The best way to evaluate the camera sensor DR is to reproduce a suitable step gray scale with a range of densities wide enough. The Stouffer T4110 transmission test target is very useful for this purpose. It provides 41 steps in a 0.1OD (optical density) progression. Each step equals a third of f/stop or EV (exposure value). Then, each three steps represents an increment (or reduction) of 1 f/stop or 1EV. The 41 steps provide a DR of 13.6 f/stops, wide enough for the most optimistic digital camera performance. Place the Stouffer T4110 test target over the diffuser of the copy stand. Mask the diffuser area all around the test target with black cardboard or any other opaque material . Regulate the camera distance in order to fill the frame in its largest side with the image of the test target. Defocus slightly the lens in order to avoid the test target film grain. Tether the camera to a computer to directly capture the raw file or transfer it to the computer each time. Avoid specially evaluating the exposure based on the camera histogram. It shows the JPEG histogram and this is not the information content of the raw file. Colour temperature adapted to provide a neutral gray with the light source employed. Transfer curve linear (no curve). Settings of highlights and/or shadows in the position that provides the widest DR (the higher number of test target steps clearly differentiated). Don’t be concerned if there is not a black step. This can be fixed afterwards. Most camera lens carry some amount of optical and/or mechanical vignetting. This causes a lower illumination at the corners of the frame related with the light level at the center of the image. Some lens profiles incorporated in raw processing software as Adobe Camera Raw (ACR) correct this problem. Anyway, it must be checked if the correction is effective in our particular combination of camera, lens and software. This is done taking an image of the diffuser without the test target and measuring the evenness of the pixel gray value all over the frame area. ACR provides a specific tool to fix the complete or residual lens vignetting. This is very important in this case because any vignetting in the image affects the test target steps located near the border of the frame. Other software as ImageJ incorporates specific tools to compensate this lack in uniformity. Prepare a spreadsheet file with a column of values representing the test target step numbers (1 to 41) or its corresponding OD (0.05 to 4.05). With Adobe Photoshop Selection Tool, trace a rectangular selection into the first gray step. As the image is slightly defocused, place the rectangular selection taking the step numbers as a position reference. Apply the Filter > Blur > Average command into the active selection. Read out the resulting averaged gray value with the Info Palette. Note the gray value and write it in the first cell of the column at right of the previously written values in the spreadsheet. Repeat the operation for all the steps of the test target image. Select both columns of values in the spreadsheet and plot a graph. Note how many steps show a distinct gray value respect the precedent. From the number of distinct steps can be quickly derived the number of useful f/stops or EV, as have been commented earlier. This procedure is essentially the determination of the device Opto-Electronic Conversion Function (OECF). The OECF provides information about both DR and Response Linearity. With the actual DR of a given device and reading the OD range of our originals on film, it is very easy to decide about the reliability of the chosen device for a given task. A second option for the gray values measurement is the use of the software ImageJ. This software is free, open source and available both for Windows and MacOS. 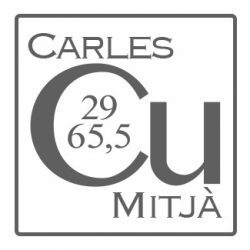 In its tools palette there are a lot of selection, averaging and measuring tools with the possibility to export the resulting measurements to an spreadsheet format. The Fig., 1 shows the image of the Stouffer T4110 test target captured by a digital camera following the described procedure. Note the defocus applied to avoid any noise coming from the test target film grain. In yellow can be seen the rectangular selection on the test step #15. Figure 1. Image of the Stouffer T4110 test target captured with a digital camera viewed on the graphic user interface of the digital image processing software ImageJ (click on the image for a larger view). In this case, the software measures the average of the pixels into the rectangular selection. This averaged value can be sequentially measured over the complete series of steps and saved as a text list of values that in turn can be exported as a Microsoft Excel file (.xls). Alternatively, the list can also be copied and pasted in any kind of spreadsheet (Open Office, Numbers, etc.). The Fig., 2 shows an example of plot corresponding to a capture with a Sony Alpha 7II camera and a given ACR settings. Figure 2. 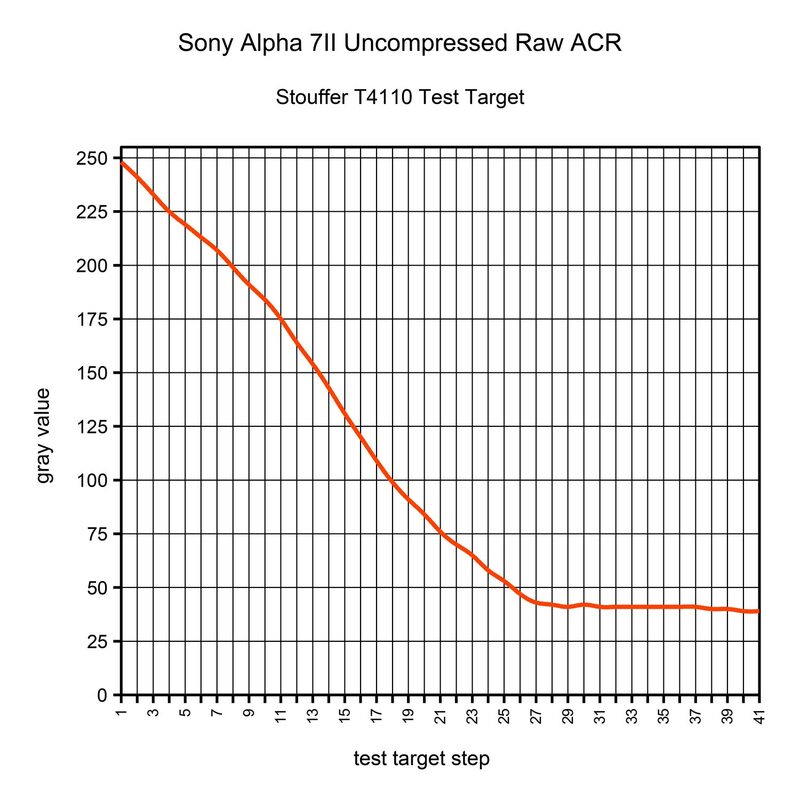 OECF of a Sony Alpha 7II camera derived from a raw file capturing a trans-illuminated Stouffer T4110 test target (click on the image to view an enlarged version). Looking at the plot in the Fig., 2 can be appreciated as, in the given conditions and settings, the camera of the example captures a bit more of nine f/stops (9.3EV). This equals an optical density range of 2.8OD. The negatives or slides to be digitized with this set up cannot exceed this density. If so, we can capture two raw files. The first with the standard exposure time and another one overexposed. The amount of over exposition must be adjusted in order to the excess of optical density in the original. Remember that the relationship between optical density and exposure is 0.3OD for each EV. The raw files captured by this method show probably a lack in linearity and a low contrast. This can be observed in the example plot shown in the Fig., 2. Then, the files must be processed in order to achieve a perceived standard aspect. Remember that rise the contrast is always possible from a flat image file. Conversely, an image captured with an excess of contrast cannot recover the information lost in the digitizing stage. This will be developed in the next post about digitization. Very clear description above the measurement of the OECF. Very good post. Thank’s Carles. Thanks for creating this article i am really big fan of image processing techniques and you have shared great content through this blog. Keep it up with good work.